Imagine I am a farmer with river running through my property. I decide to put a mill next to the river, and waste from the mill leaks into the stream, and contaminates water. The waste doesn’t affect me, since I can always draw my drinking water upstream of the mill, but it affects my downstream neighbours. The mill has positive value to me, but negative value to my neighbours, and a conflict arises out of differences in these values. This kind of problem, similar to the example Garret Hardin used in his classic paper on the Tragedy of the Commons in 1968 highlights a conflict in value faced by every social animal–where private interests produce public costs. I think one of the most important contributions of the academic social sciences to the real world is in identifying and solving conflicts of value similar to this. Here I briefly summarize some different ways that some specific sub-disciplines within the social sciences may go about addressing this kind of problem. One way is through directly negotiated compensation. If the harm I produce to others can be quantified, and the benefit to me can be quantified, I can come to some sort of arrangement with my neighbours so there is a balance of costs–either I pay for the harm, or they pay me not to contaminate the water. This approach amounts to what economists call ‘internalizing costs’; in other words, we define private ownership–say, I own me and the property I live on–and any cost incurred to me or my property by others without my consent (an ‘externalized cost’) must be paid (‘internalized’). Basically, this approach says that I am free to determine the value of things I own, and nobody has the right to reduce their value without compensation to balance the reduction in value. The challenge is that the real world is too complicated for this to work all the time. For one, ownership is often hard to define. How is the ownership of the stream determined? I don’t produce it–it just happens to flow through my land, so how much of it do I actually own, and how much do my neighbours own? Second, it would be onerous to negotiate every one of these compensation deals every time a dispute arises. Virtually everything we do probably produces some small externalized harm; it is not practical to keep track of all these harms, so much of it is left externalized. Another solution to the problem is to enter a contract overseen by a third party. This involves agreeing on some set of rules of conduct, giving a third party (‘government’) authority, which includes the means and legitimacy to punish those who break the rules. This eliminates the need to keep track of all the costs or even fully demarcate ownership. Water could be treated as a collectively owned good with rules about use–say, an environmental assessment is required to ensure that my mill does not contaminate water above some level. There are a few problems here too. First, we would need to figure out the value of things ahead of time. The government rules would have to decide what punishment is appropriate, for example, which means that the marketplace has no hand in determining the value of things. This is certain to reduce efficiency. Say, I really value the operation of my mill, and am willing to compensate neighbours for the harm it does. Well, the neighbours can use the government regulations to either prohibit the mill from operating under all circumstances, or demand a payment in excess of what would occur were a negotiation of values arrived at (a form of ‘rent’ seeking). There is a third alternative, which is kind of like the second alternative, except that in this case, there are informal rules of conduct rather than rules enforced by some coercive third party. Instead of a government creating rules, norms of social behaviour gradually emerge to manage conflicts of value without either formal negotiations or regulations. These norms can work many different ways. They can create common values–so there is less conflict over the value of things. If there is a widespread cultural value of water, it is less likely any great conflict will arise over its use–instead, use will tend toward culturally acceptable practices. They can also create value in cooperation, sharing and other practices that help prevent conflicts in the first places. The norms can emerge organically, or they can be specifically created with some short or long term goal in mind. The problem with this idea is that we live in a complex and diverse world with many values, and cultural and social norms seem too weak to govern most behaviours, particularly when the stakes are high. Furthermore, it may contribute to within-group cohesion, but actually exacerbate between-group conflict. Social norms can emerge that are counter-productive as well–serving the interests of those in power, at the expense of others. There is nothing about social norms that guarantee they will be good in any sense of the word. At its core, the social sciences often involves addressing conflicts of value. Political scientists study the formation and structure of governance–how the institutions arise, the forms they take, when they are effective and when they aren’t, and so on. Sociologists study the emergence and nature of the social norms, trying to understand what causes them to be, and how they change over time. Economists struggle directly over the value of things, trying to better estimate benefits and costs so as to facilitate better regulations, or to find instances where the direct negotiation of values can take place. Other social scientists are involved too. Geographers try to understand differences in values between places, and the connection between values of physical and human systems. Anthropologists try to describe values across cultures and social groups now and over time. The social sciences are important because they can help us understand, characterize and resolve conflicts of value, and hopefully, contribute to the myriad institutions that make societies work. This isn’t just an interesting academic exercise, it is essential to the functioning and survival of our species. This entry was posted in Uncategorized on March 29, 2016 by Niko Yiannakoulias. American movies have an archetypal ‘tavern’ scene that originates in westerns. A usually armed protagonist walks into a tavern, sizes up the customers, and then at some point a conflict arises, usually involving guns. After the gun smoke clears, the protagonist is the only one left standing, tough and invincible. Greeks have an archetypal tavern scene as well, but it goes something like this. A protagonist (possibly wearing a blazer, often over only one or both shoulders, but often not actually ‘on’ in the proper sense) goes into a tavern where there is a small band made up of musicians who sit (never stand!) at small stage at the front, or at a table. The protagonist, looking depressed and melancholy, sits down in the corner and is given a short glass half-filled with hard liquor or white wine. The band begins to play a song (perhaps one specifically requested by the protagonist) in 9/4 time. Then at some point, the protagonist is compelled to dance, and so he does, all by himself in the middle of the tavern floor with his arms outstretched. At the end of the dance, the protagonist may lay his head on the table, yell, slump back in his chair, smash something, or all four in no particular order. Example 1. Here Yiorgos Xidaris (a well known musician) plays the archetype perfectly, though his dancing leaves something to be desired. Example 2. The dancer here has already shed his coat. Note that while he has an audience, the dance is not a performance, but a private affair between dancer and the music. Example 3. The band is electrified, which makes the sound less authentic. Maybe that’s why a fight breaks out? Example 4. This dancer has a cigarette dangling from his mouth. Example 5. An example from a well known Greek film, but without the band. Example 6. A woman is doing the dancing as the protagonist agonizes. The singer in the video is Grigoris Bithikotsis, a very well known performer. The music for this song was composed by Mikis Theodorakis (who also wrote the music to Zorba the Greek). Example 7. Finally, here is a funny commercial that perfectly captures a tourist’s attempt at the tradition. The protagonist in these films and television shows is often a bit of a bad boy, loosely modelled on the manges (pronounced ‘muhn-guess’) found in rembetika music. The manges is a stylish rebel: tough, usually armed, in trouble with the law and living life to the fullest. The dance is the zeimbekiko, which is derived from the Turkish zybek dance, though the Greek version is less formal and more improvised than the Turkish version. Were they ever to fight, the cowboy from American tavern scene would probably win. For all his toughness, the manges is motivated more by his passions of love and loss than the revenge or desire to keep order that motivates American movie protagonists. The manges gets drunk, dances and falls asleep, his knife sheathed, his pistol unshot. But have you ever seen a cowboy dance? This entry was posted in Uncategorized on March 21, 2016 by Niko Yiannakoulias. Gun control advocates argue that fewer guns will reduce crime, reasoning that criminal gun use is influenced by gun availability. Their opponents argue that either 1) this doesn’t matter since gun ownership is a right that can’t be denied based on perceived or real social costs or 2) guns reduce crime. The first argument is hard to analyze empirically, and does not generalize particularly well outside the small number of jurisdictions with explicit ‘gun rights’ statutes. The second point is contestable on empirical grounds, and has been debated for decades (see Hemmenway 2014; Duggan 2000; Kleck and Patterson 1993; Black and Nagin 1998; Ludwig 1998; Lott and Mustard 1997), with the vast majority of research suggesting a relationship between accessibility to guns and gun-related crime. Nevertheless, gun control debates are often too polarized to generate useful policy, so there is little point in trying to advance a control agenda using a cost-benefit approach. Here I discuss an alternative approach. Specifically, I will treat guns as an environmental hazard, and discuss the possibility of a ‘polluter pays’ licensing fee that internalizes the social costs of firearms. This offering should be broadly supportable since it is the standard free market approach to solving environmental problems (appealing to political conservatives) but should also increase public safety (appealing to political progressives). Virtually every firearm in existence starts its life legally, passing from a legal manufacturer, to a legal retailer to a legal owner. From time to time firearms are lost, stolen or sold illegally, and end up in the hands of a person who uses them to commit crimes. Legal owners may also use the firearms in a criminal manner. The criminal use of firearms (by legal or illegal firearm owners) are the primary social costs of firearm ownership, and they exist for all firearms; no gun owner can know with certainty that their gun will never cause harm to others, and this potential for harm (no matter how small) is a cost to society at large. Many industrial activities work in a similar way, and pose a small (but non-zero) danger on human or ecological well-being. Most owners of these industries mean well and do their best to minimize harm, but the potential for harm remains, and they are regulated accordingly–with emission limits, inspection requirements, operating standards, prohibitions and special insurance requirements to cover the cost of environmental catastrophe if they were to happen. Industries that can profitably adapt to the regulations continue to do business, and those that don’t close down, but what’s important is that the social and environmental costs are often incorporated into their operational costs. Firearms offer a private benefit (joys of shooting, perceived self-defense) as well as social costs, and so I think it is useful to think of them as negative environmental externalities. Like other environmental externalities, the private benefit eclipses the social cost, but unlike many other negative externalities, the social costs of firearm ownership are mostly unpaid. In Canada, for example, a prospective gun owner must pay for gun education and pay for a possession license, but there is no specific tax on firearms themselves; a person could own 100 firearms or 1 firearm and the fees would be the same. There are a number of options for reducing negative environmental externalities, but the most simple and probably least expensive in this case would be a Pigovian tax on firearms. This tax internalizes the social costs of gun ownership directly by adding a fee to firearm purchases that covers the average social costs of firearm ownership. Pigovian taxes are often proposed to ensure that social costs are not ignored by private individuals (or firms), but do not have a specific policy purpose. Nevertheless, because they would make gun ownership more expensive, they probably would reduce the number of firearms sales. A Pigovian tax is typically based on some derivative of social cost. Calculating the precise social cost of each gun purchase is impossible (we don’t know whether or not a gun will be used in a crime a priori), but it can be averaged over the population. For example, if we focus only on murder, add up the number of gun homicides in Canada (around 150 to 200 a year) and multiply it by the value of each human life (say 6 million dollars) this gives us a total social cost between 900 million and 1.2 billion dollars a year. From this, we can calculate an annual fee that gun owners should pay for each gun in their possession to cover the social costs of their gun ownership. Simply divide the total costs by the number of guns (roughly 8 million in Canada). Based on these calculations, tax should cost between $112 and $150 per firearm per year. The cost would go up if we also included firearm injury and firearm suicide, perhaps to as much as $300 per firearm. At present, Canadians pay considerably less for their firearm licenses. A five year renewal of the firearm license in Canada costs between $60 and $80, (corresponding to at most $16 a year) and as noted above, applies to persons, not guns. This gap between what is currently paid by firearm owners and the true social costs suggests, at the very least, that there should be some discussion about increasing firearm license fees. I would also argue that the fees associated with firearm training ($150, for non-restricted weapons) should be lowered if not removed, and that more training should be made available in general. If revenue from the firearm tax were directed into better access to training, it may be possible to doubly benefit from internalizing costs–with fewer guns and more gun safety. All guns start their lives legally—they are legally manufactured somewhere, and then flow from manufacturers to retailers to private citizens through the exchange of money. 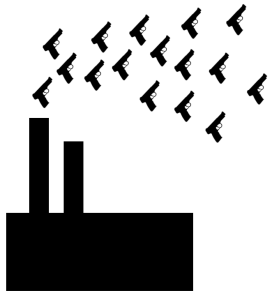 The legal purchase of a firearm increases the pool of firearms available for use in criminal acts, which in the language of environmental externalities, increases public exposure to hazard. This is true whether the firearms are in the possession of legal owners or not; after all, illegal firearms are only illegal because legal owners were unable to secure them, or transferred them illegally. Owning a gun imposes a social cost, and owners that decide to own guns for private benefit should be held responsible for their decisions. Note: Firearm and ammunition taxes have been recently implemented in Seattle, and in Canada, the Conservative government waived the firearm licensing fee between 2006 and 2013. This entry was posted in Uncategorized on March 13, 2016 by Niko Yiannakoulias.